*Golden Globes: Won Original Song, Original Score, Director and Picture. Nominated: Screenplay, Actor (DiCaprio), Actress (Winslet), and Supporting Actress (Stuart). SAGs: Won Best Supporting Actress. Nominated Best Actress and Cast. *Tied with most Academy nominations for a movie (14) with ALL ABOUT EVE. *Tied with BEN-HUR and LORD OF THE RINGS: RETURN OF THE KING with most Academy wins with 11 awards. *Highest grossing film of all time for 12 years. *Cameron used Digital Domain to push the visual effects boundary and continue the evolution of digital technology that he pioneered while working on THE ABYSS and TERMINATOR 2. 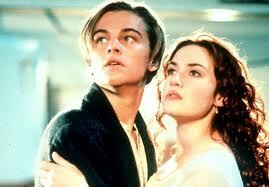 Jonesy: Where were you when TITANIC hit the big screen? My family actually went on a school night to see it, which was insanely rare for us. I remember being in absolute awe of the film, but I'm also taken into account that I was 12 years old. Plus, I believe I saw the movie four times in the theater, which is a lot for me even by today's standards. But I remember how strange it was that literally everyone I knew had seen this movie. I hadn't revisited the movie since I was younger, so I was very curious if the movie would hold up so many years later. And, well, half of the movie held up. It's no secret that James Cameron isn't a modern-day Shakespeare. A poor guy and a rich girl falls in love but can't be together has been told over and over again. So other than taking in the details of the sets and costumes, the first half of the movie, where the love story takes place, is tough to get through. Also, since you're waiting for the iceberg to hit so the good stuff will happen, I caught myself looking at my watch trying to hurry the movie up. It isn't until the action of the second half happens that this movie solidifies why it is on the countdown. The visuals and action during the last hour of the ship sinking is such a spectacle. Some moments right before the ship goes down completely are chilling and still give me goosebumps when I see them. If I could just recommend people see the second half of the film, I would. TITANIC is one of those movies that comes along every once and while that depicts a real event with such realism and attention to detail. And like it or not, Cameron knows how to make a crowd pleasing movie. It's a sprawling epic of a film that I remembered captured me as a kid. However, it has lost some of its charm upon revisiting it for the countdown. 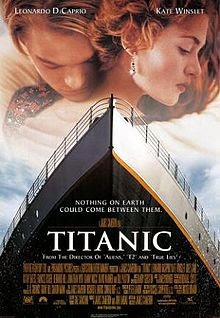 **Side Note: James Cameron is re-releasing TITANIC in theaters April 6, 2012 in 3D. This project has taken Cameron almost three years to perfect. I'm not normally a proponent for seeing a movie that has been unconverted; however, this process wasn't rushed, so maybe Cameron has found a way for a post-conversion not to ruin a film. We shall see. Javi: This was probably one of the most painful movies to watch for me. It's not a bad movie by any means of the imagination, but it's just a very boring and mediocre. James Cameron has become the dude that makes technically amazing movies with very boring stories. I know that this is only counting TITANIC and AVATAR, but that's like 50% of his filmography. Regardless, I can only really take a look at this movie from an acting and technical point of view. In terms of the performances, the charm exhibited by Leonardo DiCaprio and Kate Winslet are the reasons why they have become stars in their own right. They elevate the rather mediocre material to something that a whole generation of girls who couldn't get boyfriends could envision themselves in Winslet's role and could fetishize DiCaprio's character for years to come. Between the supporting cast of Sydney Bristow's Dad as the Captain, Billy Zane as a rather righteous villain, and Kathy Bates as that sassy rich lady, you have quite the colorful cast of people. The special effects that had to be rendered in order to create the illusion of the great big ship going off to its doom is quite impressive. But if you really want to know about it, you can just watch the special features, and they go into more details than I ever could for the purposes of this column. Either way, I get why it's on this list, but it should definitely rank lower as there are other movies that hold up better over time.